Our Twenty-Four Seven Club™ services have been designed to provide you with a total solution to your health concerns. Services that are medically required or indicated, and covered by Alberta Health Care, will be provided by Preventous physicians and billed to the Alberta Health Care Insurance Plan. When you call for an appointment, it will be scheduled on a timely basis, based on your immediate needs. Timely appointments to monitor and manage ongoing health issues. 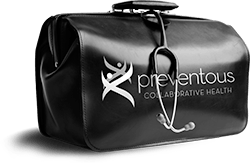 Visits with your Preventous health care team are never rushed. When you make an appointment, we ask how much time you will need and we book your visit appropriately. When you have urgent concerns outside of normal office hours, you can call our dedicated support line and receive a timely response. We know you want the best health care not just for yourself but for your whole family. Our healthcare team, both male and female, have extensive experience in family practice, urgent care, pediatrics and obstetrics. They will get to know everyone in your family and understand their unique health issues and requirements. Referrals, when required, for specialized services such as lab testing, diagnostic imaging and medical specialists. Referrals for other health services including psychological counselling, life coaching, massage and other therapies. The annual Twenty-Four Seven Club™ fee is for uninsured medical services only. Your Total Health Assessment™ is the most comprehensive health evaluation available to determine your current level of health. The assessment involves complete medical, fitness and nutritional testing. Using the results of your assessment, we will collaborate to develop a plan tailored to your specific needs and goals and designed to reduce your risk factors for heart disease, stroke, cancer and other illnesses. With a busy schedule, it’s easy to forget to look after your health. We do that for you. Our team will monitor your health on a regular basis and let you know when it’s time to come in for preventive medical consultations, or fitness and nutritional counselling. We understand that many parents are more concerned with the health of their children than with their own health. Your annual Twenty-Four Seven Club™ fee includes medical, fitness and nutrition services for your children 18 years of age or younger. Our dedicated physicians will spend time with you to discuss your lifestyle habits, potential risks for disease and preventive strategies to achieving a healthier lifestyle. Your registered dietitian meets with you regularly to review your healthy eating plan and make sure you’re on target to attain your goals. Counselling with a dietician are included in your membership. You also receive access to our personalized online nutrition records. Your kinesiologist monitors your fitness level and helps you stay on track through frequent updates of your activity plan. Fitness counselling sessions are included in your membership. Avoid the health risks of travel with our help in the form of pre-departure preparations, vaccine recommendations, advice on safety considerations and more. Your membership includes unlimited travel consultations and travel reports. Your membership includes 4 educational seminars by various health practitioners on issues relating to you and your family’s health.